This month’s box contained a lot more goodies as Simply Earth’s March launch of the Big Bonus Box. It gets you set up for all the recipes to come in future regular-sized boxes. The Products: 4 full-size 100% pure essential oils + 1 -2 extra + bottles to make 5-6 recipes around each month’s theme. Simply Earth donates 13% of profits to fight human trafficking. This Bonus Box included a lot of extra items and containers to get us set us for recipe boxes to come! Cardamom has been used in traditional Chinese and Indian medicine for over 3000 years to treat fever and digestive tract ailments. It can be massaged over the lower abdomen to ease stomach gas, or it can be used in a diffuser to ease respiratory inflammation and even aid concentration. It has a spiced, woody smell to it that I really enjoyed in my diffuser! Straight-up oranges in a bottle, I tell ya. The scent is so vivid, bright, and tangy! I can totally see how this could have antidepressant therapeutic properties, as the site indicates. (It’s also an insect-repeller, general mood-booster, and anti-inflammatory.) I applied this with one teaspoon of the almond carrier oil, as instructed on the bottle, and it felt SO rejuvenating. Rubbing the topical blend on my upper back and shoulders in the morning seems like it’d be the peppiest way to start my day! Simply Earth describes this as “a sensual blend that’s sure to add a little romance to your life.” The blended ingredients are Ylang Ylang, Bergamot, Sweet Orange, and Amyris. It was claimed they “increase romantic feelings,” so it really felt like I was pulling out a Love Potion from Harry Potter or something, ha! As recommended, I added three drops of Love Essential Oil Blend to my diffuser to “set the mood,” but was really surprised at its scent. I swear, it smelled mainly like bubblegum! No joke—I even called my roommate into my room to see what she thought, and she agreed. Bubblegum certainly isn’t the first aroma I think of when considering “sensual” smells, so I think I’d ultimately pass on using this for anything but a peppy diffuser scent. I’ll touch more on this later when diving into this box’s recipe reviews, but I put lavender in my diffuser before falling asleep and it smelled amazing. The only thing is—and I’m not sure if maybe I was just catching a cold to begin with—I woke up with a runny nose the next morning. It was more like nasal drip (you know, the back-of-the-throat runniness that normally precedes a cold?) I was pretty surprised, and would love to know if any of you have ever experienced something similar when sleeping with lavender in your diffuser! This is what they call a “carrier oil,” often used in conjunction with essential oils for skin application, as it’s a good rule of thumb to avoid applying essential oils directly on your skin. This almond oil can also be used on its own to promote healthy skin, hair, and nails! The best part is—it doesn’t clog pores. It has a slightly sweet, barely-there aroma to it. Up next: Coconut Oil! I wasn’t able to find it on Simply Earth’s website, so its value is estimated based on similar products from Amazon. This can be used as another carrier oil to blend with your essential oils. It can also be used on its own! It absorbs easily into the skin and won’t clog pores as it nourishes and moisturizes. This was such a neat item to receive! I’ve never seen what natural beeswax looks like in pellet form. This item is used for natural skin care and came into play with some of the recipes included in this box. It melts down very easily over a double-boiler and can be used for lots of home remedies and creations. This is not only a cute scarlet accessory—it’s also a way to use your essential oils! The tassel and charm necklace is crafted from genuine leather and a hand-rolled terracotta bead. To keep the aromas of your essential oils around you all day, you simply place a drop or two on the terracotta bead, which soaks it up and diffuses on its own! The “World Changer” charm is stamped by a Haitian artisan group, and its words help share the story of how sustainably-made products can bring tangible changes to Haitian communities. The box came with two of these aluminum spray bottles, which can be used for any liquid. It’s well-crafted and sprays a thin mist, rather than big droplets, which makes it perfect for essential oil sprays! There’s also a well-fitting lid to prevent leakage. The price for each bottle seems a little steep to me, however. Another sprayer! I like the durability and safety that comes with plastic bottles. This mist isn’t as fine as the aluminum’s spray but it’s a great spritzer. This lid also screws on to prevent leaks. This is a squeeze bottle—it looks a lot like those cosmetic containers used to hold beauty products for air travel. It’s the same plastic material, but a bit more squeezable to allow for easy use with thicker mixtures. Roll-ons are used for skin application of small batches of oil blends and carrier oils. They have metal roller balls that move quickly and easily across the skin. The roller ball is attached to a plastic piece that pops off to allow you to pour in your oils and blends. These tiny, 5-mL bottles are perfect for mixing your own small batches of blends. The dark amber glass also protects oils from sunlight, which can harm or weaken their effect! There’s a small plastic covering atop the inside of the bottles that helps the oil come out in drops rather than pouring out quickly. More storage! These 4-oz. jars have a secure screw-on lid and a protective cover inside to prevent leaks. They’re great for lotions, creams, balms, butters, and makeup products. These nasal tubes are great for a little aromatherapy on the go. A tight-fitting cap secures the wick inside securely in order to preserve the oils’ healing properties to garner best effects. Yet another jar. So many jars! These glass ones are really sturdy with a good bit of weight to them. These durable jars can also be used for creams, lotions, aromatherapy, balms, and other remedies. Their lids screw on tight! The final jars—in miniature size! These are so dang cute and would be great for essential oil lip balms and lotions to take on the go. This is the container I’m most excited to use! This is the recipe that put the World Changer necklace to good use. I mixed a blend of 40 drops Cardamom and 40 drops Blood Orange Essential Oils in a 5-mL amber glass bottle. Once gently mixed, I placed 2 drops on the terracotta bead of my necklace to let them absorb and diffuse. The ultimate aroma was an AMAZING combination of citrus and earth tones. I would be energized by this any time of the day. It smelled so pleasant—like a gentle, enticing perfume! Hooooo boy. The good ol’ love potion. As I said before, this blend isn’t for me. All three recipes used only the Love Essential Oil Blend itself, so they all ended up smelling like bubblegum. (In my opinion!) The ease of this recipe was very appreciated, however. Sometimes its nice to keep things simple. Now, I unfortunately misplaced the next two recipe cards before I was able to photograph them, but as Simply Earth keeps their recipes online, I was able to get a little crafty with Photoshop to type up and replicate the cards themselves! These are the exact recipes I followed—some of them were trickier and messier than others! I had to do a little research to find out how to go about melting the beeswax after misplacing my recipe card, but luckily Simply Earth explained it in a variation recipe for another lip balm. I brought two cups of water to a boil in the lower double-boiler pan, and once it was bubbling, placed my 1 Tbsp of Beeswax above it. Once it was juuuust melted, I moved onto step two and combined it with all the other ingredients. Gave it a little gentle stir, and quickly poured it into my lip balm tubes to let it cool and slightly solidify! That part was super-messy, I will tell you. For those with not-so-great pouring aim like myself, be careful! I was SO surprised at how wonderful this lip balm turned out! It’s smooth but isn’t very glossy when applied to your lips. The smell is bright and cheery, and slightly sweet thanks to the honey! It’ll be hard to give up my go-to Vaseline, but knowing this lip balm is chemical-free and helps fight human trafficking through Simply Earth’s donation makes it an obvious switch. Now, this was a way to get me excited about doing laundry for once. I was so pumped to see if this natural boost would make a difference! For those concerned about the increasing presence of chemicals in store-brand laundry detergents, this would be an amazing and natural alternative. It was a very simple recipe—it only took a bit of mixing—and pouring the grainy, final mixture into a glass container was strangely satisfying. I added 1/8 cup of this mixture to a normal-sized laundry load, along with my normal detergent tabs. (This mixture isn’t meant to fully clean—only freshen!) I could definitely smell its refreshing citrus aroma after pulling my clothes out of the wash, but once they went through the drier, I couldn’t get too much of a whiff. I might try it again and add a few more drops of each oil next time! A triple-threat combo! The Love Essential Oil Blend, Blood Orange, and Lavender Essential Oils all combined in this one to make a VERY invigorating mixture. Waiting for 40 drops to drip three times in a row was a little tedious, but the ultimate result was worth it. The Lavender and Blood Orange definitely masked the bubblegum flavor I was smelling, and they combined to create a citrusy, peppy-yet-subtle scent. Combine that with the cost of each Essential Oil, plus the creations that come from their included recipes, and you’re approaching $100! And on top of the amazing value, it’s an added feel-good factor to know that portions of the cost are going to fight human trafficking. Value Breakdown: This box costs $39.00 (with free shipping) so you’re paying roughly $1.05 per item—37 items in total! 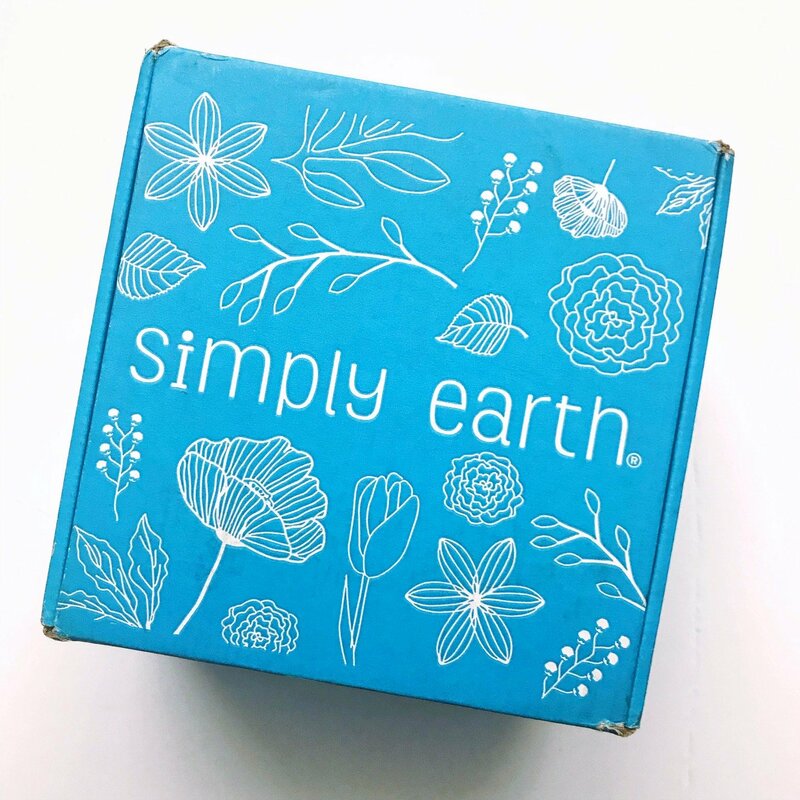 What did you think of the Simply Earth Big Bonus Box? Hi Katie/ Liz, I just clicked through the link and saw that the monthly subscription is now $39/month — and new subscribers will start with the MAY month box, not the MARCH box as reviewed. This seem to differ from the review’s comment that I can still get this box if I signed up today… can you verify that? Thanks! If there’s anything else you’d like us to help you with, do not hesitate to reply to this email. Have a great day! Simply Earth – Donates 13% profit to help end human trafficking. I have subscribed to this box more a few months now and I absolutely love the various essential oils and blends that I have received. The recipes are not time consuming or difficult in anyway. I have learned a lot about essential oils in the few months that I’ve been receiving this box! If your in the fence..this sub is great and I have always received double the cost of the box in products! Is this March’s boc or May’s? And I can still purchase this exact box? This is March’s box! (A bit late on our end, but its huge amount of goodies were cherished nonetheless.) You can get this box today by signing up for a new Simply Earth Recipe Box subscription. Use the code BONUSBOX to receive a Big Bonus Box with a new subscription plan! I’m so sorry this Big Bonus Box is sold out. I also spoke with Simply Earth and was told that their next round of Big Bonus boxes will be coming out in September! Hi there! Justine here from Simply Earth. The items in this stellar post are no longer available as a box however, you are more than welcome to purchase them separately. I just shared this with my husband with a *hint* Mother’s Day note. He just walked by my office and said, “Happy Mother’s Day!” Thank you for this post!! I dabble with a few home essential oil recipes and make a number of cleaning products but would love to expand on our e.o. usage and knowledge. This is a great starter kit! Thanks again! Just FYI coconut oil WILL clog pores. It’s very comedogenic. It’s advised to not put in your face. It’s much to heavy to provide any moisture to your face as it just sits on the skin. Ummmm. Seriously thank you for that! I use coconut oil to remove my eye makeup, and my nose has been broken out for about as long as I’ve used it. No zits, but just redness and a few tiny Whiteheads. I chalked it up to the weather here in CO, but maybe that’s it! I’ll quit the coconut oil and see if it makes a difference. Thanks! You definitely should give it up and give up any products that contain it! There are some fractured coconut oil derivatives that won’t clog pores, but coconut oil absolutely will! Plus, it doesn’t even hydrate as it’s too heavy to absorb fully into the skin and provide moisture. There are tons of oils (jojoba being a popular one) that won’t clog pores and are suitable for all skin types. A great oil cleanser will remove that makeup without any of the other side effects! Yes, thanks for your input, Dani! I’ve never found that coconut oil makes my face break out, but, like all skincare—different reactions for different skin!